The Northarvest Bean Growers Association is a major contributing member of the U.S. Dry Bean Council (USDBC). Working with USDBC, our dry bean growers made contact with countries around the world to maintain existing markets and explore opportunities to develop new markets, monitor trade policy and market trends, and discuss dry bean demand with importers, wholesalers, packagers and retailers. The USDBC exists to increase the consumption of U.S. dry beans worldwide. Joe Mauch, Hankinson, N.D. and Kevin Regan, Webster, N.D. represent Northarvest on the USDBC Board of Directors. During the harvest of 2017, dry bean importers from the Dominican Republic were in North Dakota to learn more about slow darkening pinto bean varieties. Manuel Sarra, general manager of Importadora del Sur, and Darina Mejia, international purchase manager from Grupo Perfesa, were hosted by the NBGA. A record 200-plus crowd gathered in Cancun, Mexico from February 8-11, 2018, to hear the latest about NAFTA negotiations, U.S. and Mexican market conditions and production for U.S. dry beans, as well as new opportunities to innovate with beans. This year’s climate was marked by a slight downturn in Mexican bean production, and an increase in U.S. bean production, making the market prime for purchases of U.S. dry beans. USDBC held its annual winter board meeting in conjunction with the Mexico Bean Congress in Cancun, Mexico. At the election, Deon Maasjo of the North Central Bean Dealers Association was named President, Clint Stoutenburg of Michigan Bean Commission was named Vice President and Joe Mauch of the Northarvest Bean Growers Association was elected Treasurer. USDBC newly elected Board Officers, Deon Maasjo, Joe Mauch and Clint Stoutenburg, attend a lunch discussion with Undersectreatry Ted McKinney. 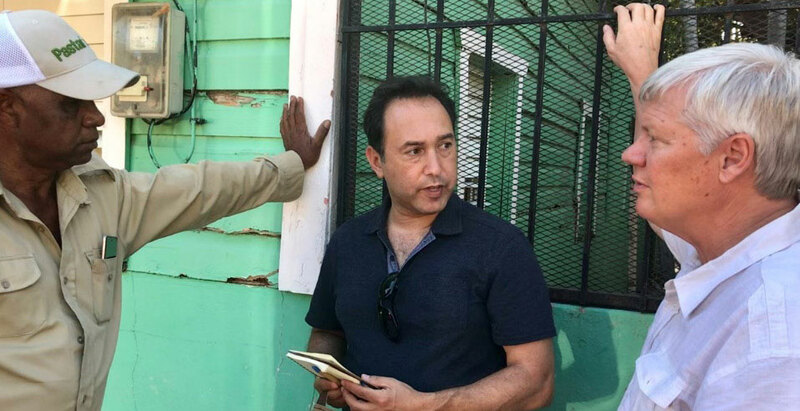 In March 2018, Kevin Regan, Webster, N.D., represented Northarvest and the U.S. Dry Bean Council during a seven day visit to the Dominican Republic and Jamaica. While visiting the Carribbean, the group met with importers, brokers, wholesalers, packagers, food manufacturers, retailers and farmers. Market research was conducted in both countries to evaluate production and consumption trends, as well as new market opportunities. Kevin Regan (right) visits with Caribbean dry bean buyers on the trip. In May 2018, Jon Ewy, Deer Creek, Minn., represented Northarvest and the U.S. Dry Bean Council during a seven day visit to Argentina during their harvest. 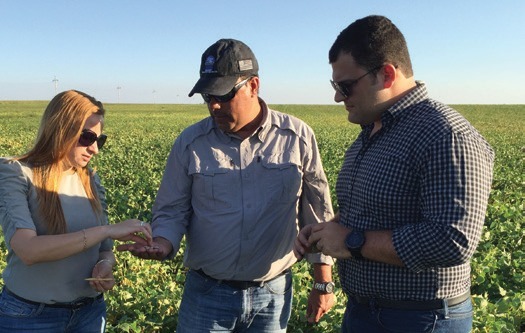 Throughout the team’s visit, they met with growers, agronomists, processors and traders to better understand the dry bean value chain in Argentina and the trends in international marketing. They also assessed and reported on the 2018 Argentine dry bean harvest by bean type. More than 20 buyers from ten different countries were hosted through USDBC successful reverse trade mission in September 2018. Participants visited harvest sites, elevators and participated in briefings and business meetings in North Dakota, Michigan and Nebraska. This mission is one of USDBC’s flagship initiatives. In Santiago del Estero, Argentina, L-R: Ellen Levinson (USDBC), Dario Bard (USDBC), Santiago Seiler, Jr., Santiago Seiler, Sr., Federico Seiler and Jon Ewy (USDBC, Northarvest) in the hanger where the Seiler’s have their six crop duster planes. Northarvest supports the efforts of the Northern Crops Institute (NCI) which is a collaborative effort among North Dakota, Minnesota, Montana, and South Dakota to support the promotion and market development of crops grown in this four-state region. NCI is an international meeting and learning center that brings together customers, commodity traders, technical experts, and processors for discussion, education, and technical services. Situated on the campus of North Dakota State University, in Fargo, North Dakota, USA, this unique facility is only minutes from the farm fields that yield much of the world’s food. For more information about Northern Crops Institute go to their website at Northern-Crops.com. 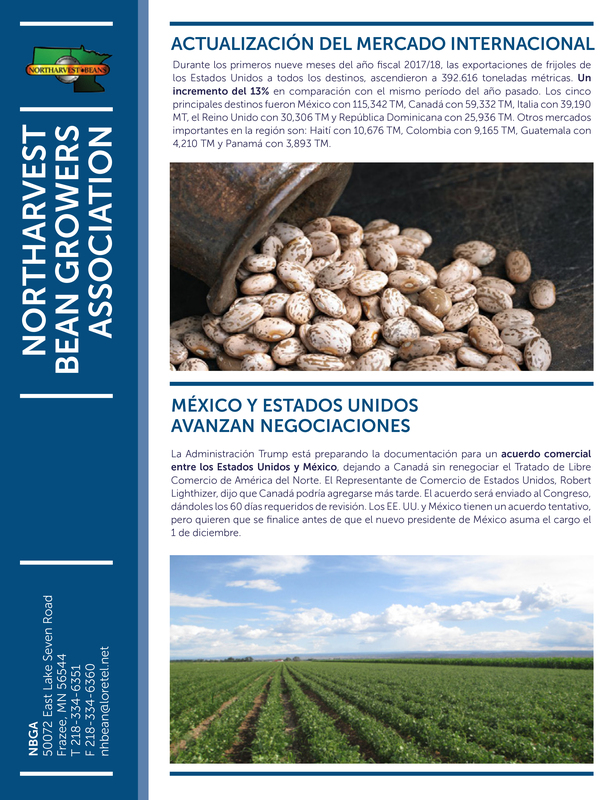 Fradbelin Escarraman, consultant and publisher from the Dominican Republic, creates six e-newsletters for Northarvest. The Trade Servicing E-newsletter is distributed to the Dominican Republic, Cuba, Mexico, Central and South America. The topics included in these e-newsletters are product information, quality issues, prices and trends. Escarraman also maintains continuous contact with current and new importers by gathering market intelligence and keeping an updated database. He then returns information from the buyers to Northarvest indicating any constraints or needs that need to be addressed.